We’re into the second half of the NFL season, and we’re beginning to see who’s likely to be challenging for playoff spots and who’ll already be looking to plan their early first-round draft picks for next year. The playoff picture in the NFC is beginning to look very interesting as a number of contenders are beginning to show form at a key stage in the campaign. Sean McVay’s Los Angeles Rams started the campaign as the Super Bowl favorites, and have looked almost unstoppable this season. Armed with a quarterback whose confidence is growing by the week (Jared Goff) and the best running back in football (Todd Gurley), the Rams have the perfect offensive base to challenge anyone when they have possession of the ball. But, as the old adage goes, offense wins games, defense wins championships, and the Rams’ defense has looked outstanding this season. They’ve bolstered their secondary with the arrivals of the likes of Aqib Talib at safety, and strengthened up front with the big-money arrival Ndamukong Suh, who has partnered up with arguably the best defensive player in football, Aaron Donald. Throw in McVay’s coaching prowess and aggressive style and the Rams look every inch Super Bowl contenders. The NFL betting markets have the Rams as deserved favorites to win the Vince Lombardi trophy, but they’re not the only side with a serious chance of winning the Super Bowl this year. Behind the Rams, the New Orleans Saints might be the biggest contenders for the NFC title. They have a superb defense and their offence, led by evergreen quarterback Drew Brees, has weapons all over the field, with the likes of Alvin Kamara and Mark Ingram in the backfield and Michael Thomas out wide. And, just like the Rams, the Saints have an aggressive coach in Sean Payton. The Saints proved their Super Bowl potential by outgunning the Rams in Week 9, and a team that some were unsure of as possible challengers are now looking much more likely to be there in the final reckoning. The Minnesota Vikings have a scary-looking defensive front, led by the returning Everson Griffen, but it’s their improved offense that could prove the difference-maker this season. Wideout Adam Thielen having an incredible year, plus the big-play ability of his opposite number Steffon Diggs, the Vikings have all the ammunition they need for megabucks quarterback signing Kirk Cousins to fire them into the playoffs and beyond. The big question for Head Coach Mike Zimmer is whether he can get enough out of his running game to keep them in games when their passing game is being shut down. If they can maintain consistency, the Vikings should be there or thereabouts. The Saints’ closest challengers in the NFC South, the Carolina Panthers, are beginning to hit form, with quarterback Cam Newton and livewire do-anything back Christian McCaffrey coming to the fore in recent weeks, while Mitch Trubisky and the Chicago Bears are giving the Vikings a run for their money in the NFC North. And, of course, we can’t go without mentioning the defending Super Bowl Champion Philadelphia Eagles, who will be hoping to hit form with fit-again quarterback Carson Wentz and force themselves back into the playoffs after a slow start to the season. The NFC East is wide open, leaving the door open for the Eagles to find form and claim the division title. The playoff picture will no doubt fluctuate as the season progresses, but with the Rams and Saints looking the top two teams in the NFC, the challenge is on to see who can join them in the playoffs by the season’s end. 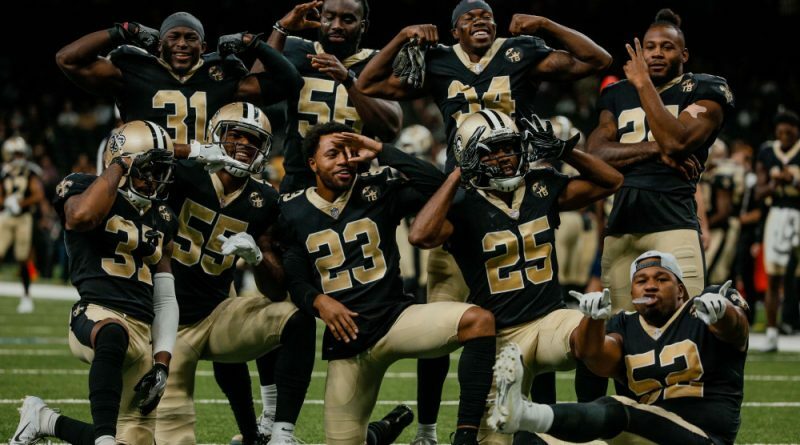 I think the Saints are the best team in general. Rams D has been too suspect lately and the Saints are all starting to click, and their offense is the second best in the league IMO (besides Chiefs).